ATLANTA -- With a damning secret recording of his opponent and a Trump-Pence endorsement late in the race, Secretary of State Brian Kemp won a bruising Republican runoff Tuesday in the race for Georgia governor. Kemp in November will face Democrat Stacey Abrams, who could become the first black woman governor. The race will test Democrats' assertion that changing demographics have turned the Republican stronghold into a swing state. 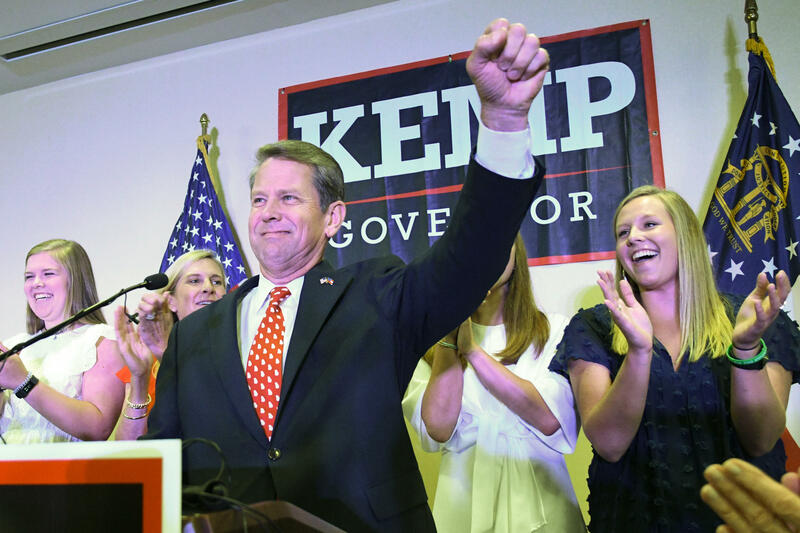 Kemp beat once heavily-favored Lt. Gov. Casey Cagle, who outraised Kemp more than 2 to 1 and had a Rolodex of endorsements from establishment Republicans in the state including Gov. Nathan Deal. The NRA had thrown their support behind Cagle, CBS Atlanta affiliate WGCL-TV reports. In a tweeted endorsement last week, President Trump pointed to Kemp's tough stance on illegal immigration and strong support for gun rights. With days left in the race, Vice President Mike Pence also stumped for Kemp on the campaign trail. Both reiterated their support for Kemp in tweets Tuesday. Kemp thanked supporters at a party in his hometown of Athens, Georgia, Tuesday night. He said he had won a "clear, convincing victory" over Cagle and credited the White House's backing for sealing his win. He said Trump "poured gasoline in the fire" that fueled his victory. Kemp also pivoted to attacking Abrams. He portrayed the race against her in November as a battle with the "radical left" as Georgia's future hangs in the balance. Cagle asked his supporters to stand behind Secretary of State Brian Kemp's bid for governor. After conceding the GOP runoff to Kemp, Cagle told supporters Kemp was "undeniably ready to lead this state." Cagle began to lose ground after the release of a secret recording in June in which he says he helped pass a "bad public-policy" bill for political gain. The recording was made without Cagle's knowledge during a private conversation with former GOP gubernatorial rival Clay Tippins, who last week endorsed Kemp. Portions of the recording were released by Tippins and then by Kemp's campaign. In a 50-second piece of the recording released in early July by Kemp's campaign, Cagle candidly discusses the GOP primary's sharp turn to the right, saying the five-man race came down to "who had the biggest gun, who had the biggest truck and who could be the craziest."